Extending his own period home, architect George Woodrow had the opportunity to show that “the experimental can lead to great results”. 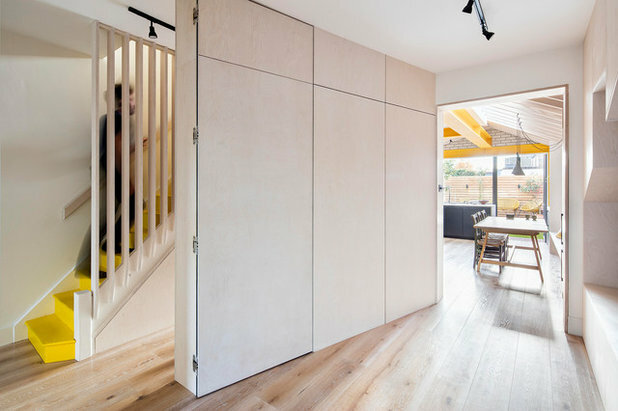 The experiment in this case was a kitchen-diner extension into the side return that shows off its structure beautifully. What’s more, it’s created a sociable hub where friends and family can gather and spend time together. 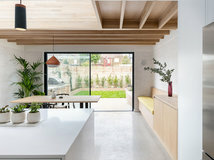 Walls were demolished to open up the side and back of the house, with the new extension forming an L shape around the outrigger. Tempted by something similar? 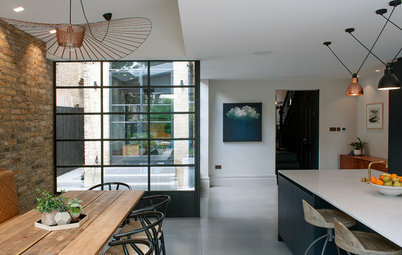 Read reviews of architects and building designers in your area. 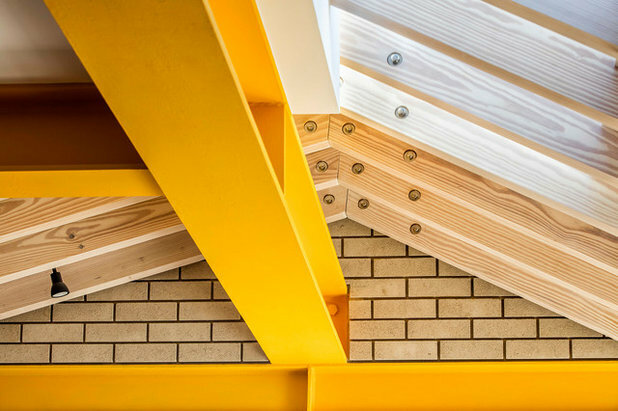 The timber, brick and steelwork used for the extension are a striking feature of the design, revealing how the building is constructed. 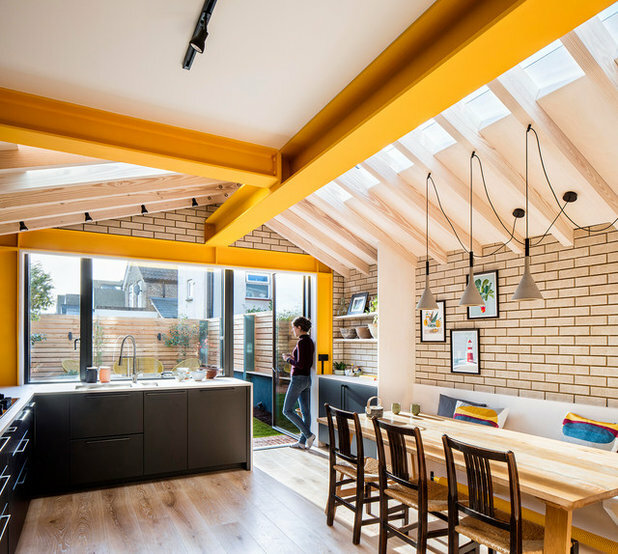 Not boxing in the steels also creates a greater sense of space, and, rather than a dark colour, George chose to finish them in an uplifting bold – RAL 1023 Traffic Yellow. 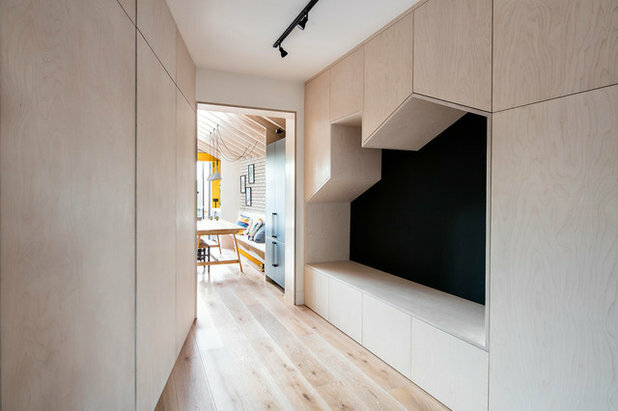 The room’s rafters are made from southern yellow pine and the infill panels are birch ply. 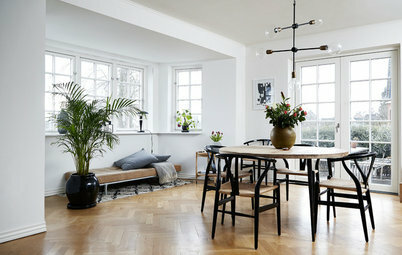 They have a whitewashed, Scandinavian-style finish that distinguishes them further from the orange varnished pine the family lived with before. 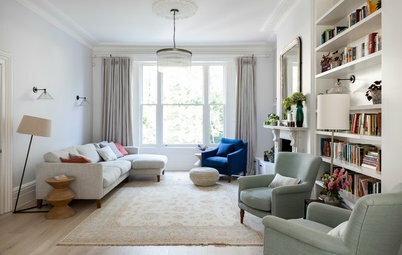 “It’s a lighter, brighter look and it contrasts with the floor,” George says. 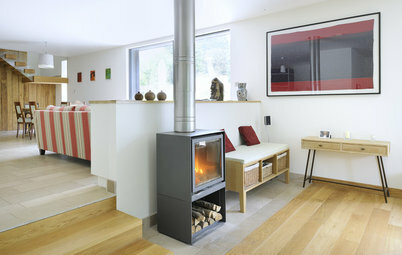 The flooring is engineered oak, which was used throughout the ground floor. 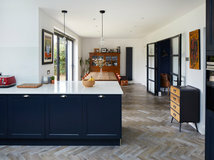 It, too, has a whitewashed effect that ensures it has none of the orangey tones of the old pine kitchen. 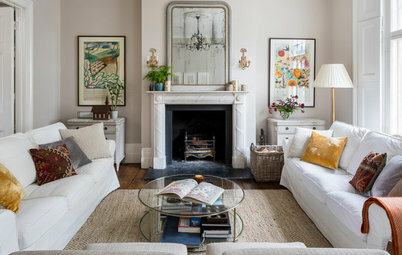 Below the bench is one of the yellow radiators that inspired the colour scheme, and its under-bench position makes the table an extra welcoming place to sit in winter. Flow Form radiator, Bisque. 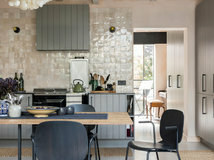 Aplomb pendant lights in Concrete Grey, Foscarini. Quartz White bricks, Edenhall. 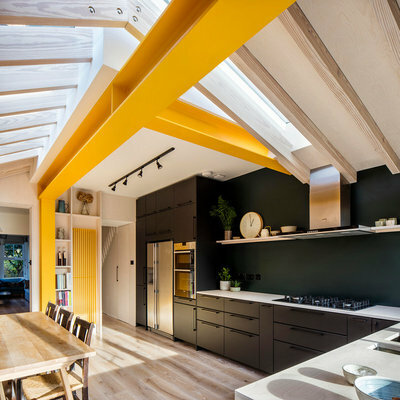 Rafters and birch plywood panels, Moss & Co.
George wanted a dark grey or black kitchen to create contrast with the rest of the space. 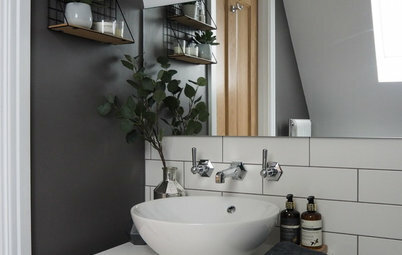 The version he found has subtle detailing with chamfered edges and a matt finish that “doesn’t draw too much attention”. 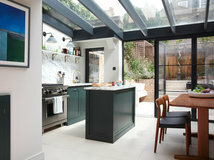 Wipeable kitchen paint in RAL 6012 Black Green was used for the splashback – a decision that took a lot of thought. “We can amend it in the future, but I really like the look. 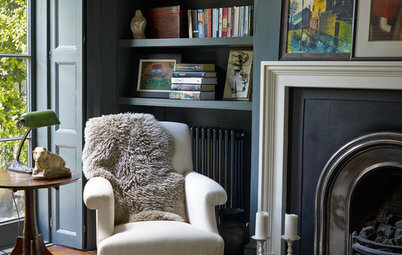 It blends into the background,” George says. He chose not to hang wall cupboards to avoid closing in the space, and storage around the fridge and on the bench side of the room means there’s no shortage of stash space. 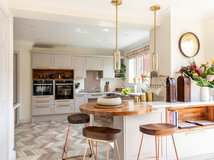 Open shelving above the worktop makes room for decorative objects. “It helps it feel less like a kitchen,” George says. Kungsbacka kitchen, Ikea. Handles, IronmongeryDirect. Black track and ceiling-mounted lighting, Modern Lighting Solutions. Finn radiator, Bisque. Like the splashback, the choice of worktop proved a hard decision. 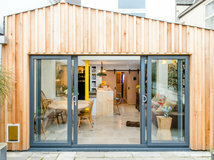 After looking at various options, the couple plumped for spare plywood. “It’s heavily oiled and it does need maintenance, but it saved money, we like the look, and it feels a lot warmer than stone,” George says. The fact that the surface can take the wear and tear of family life and, if necessary, be replaced several times for the cost of using stone once are other bonuses. 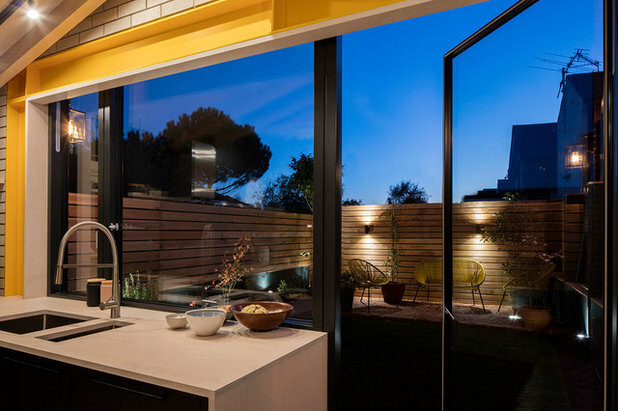 The couple wanted the sink to overlook the garden so they’re interacting with the outdoors every day. A large glass door was fitted to give access to the exterior and both this and the windows maximise sightlines with slim framing. 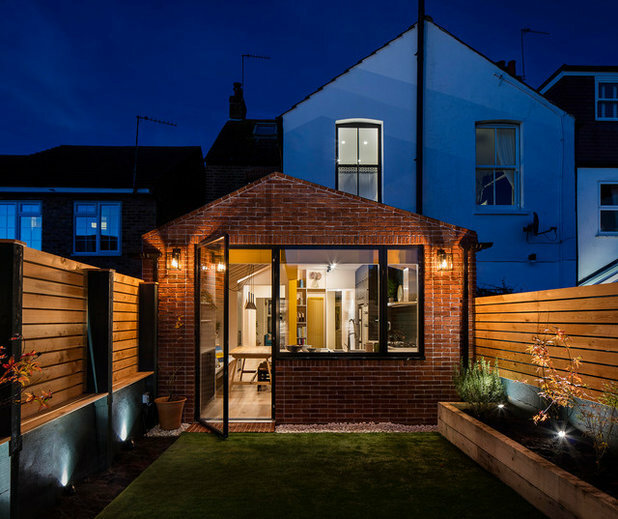 The front of the house is red brick, so using brick on the extension tied it into the original property. George chose a thinner, Tudor brick for the addition, however. 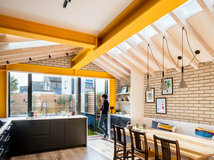 “There are more horizontals in the build up, so it looks more refined and works well with the slimmer glazing and more modern extension,” he says. 2in Tudor bricks, Imperial Bricks. 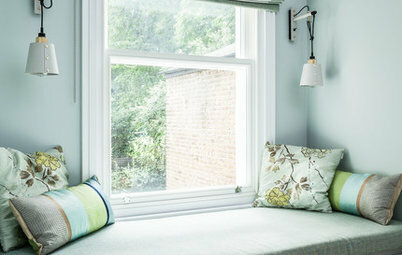 Choosing new windows for your home? Take a look at this expert advice first. 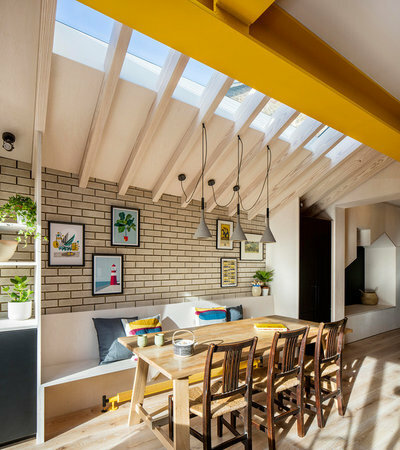 The addition faces south, so daylight is plentiful, and the rafters create attractive shadows in the room when the sun’s out. 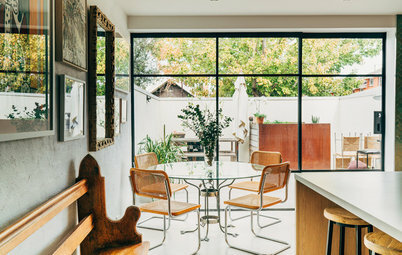 The washing machine doesn’t have to share the kitchen space. George included a utility area in the tapering partition, along with storage. 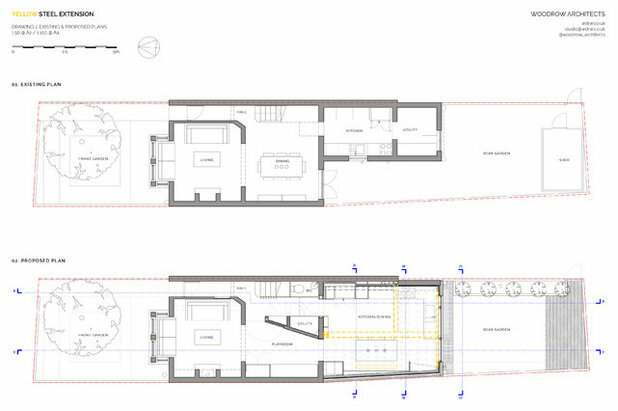 …and to the right is a play space, with built-in cabinetry that makes tidying away toys easy. What do you think of this fun design? Share your thoughts in the Comments section. This site is a treasure trove of examples of folk's hand crafted homes. 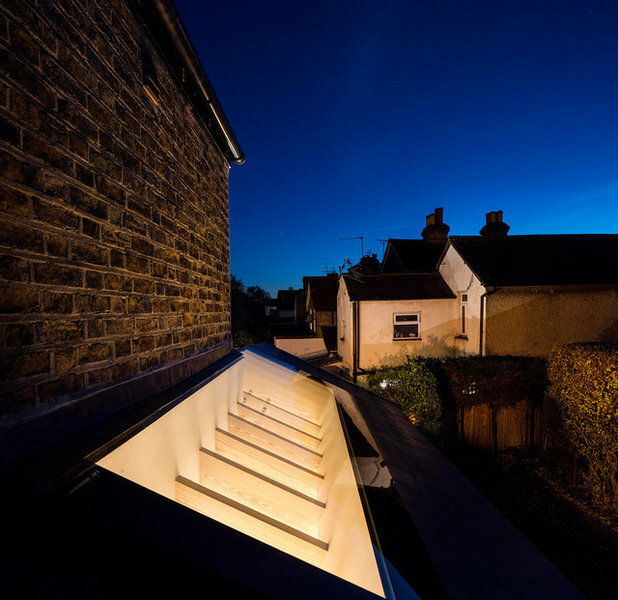 Obviously, architects bravely putting forward their own homes can face pointed observations. Last year I surveyed a slightly larger Victorian end terrace (major town an hour out of London), really well refurbished but with very similar cloakroom / utility ridiculously planted in the rear reception room! My clients nearly didn't exchange, struggling with the ill-considered layout. 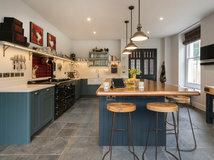 Larger reception rooms, dual aspect rear room, narrow attached garage, big garden, meant the property luckily had scope for 3m wide side return extension, leaving side alley, all to create incredible 9.5m x 6m long kitchen / family room. Space for light well area meant no unwise costly structural efforts to join up rear reception that could then serve as a sunny office / playroom. When funds permit they now have a single achievable goal based on an affordable, practical plan that will add value outside of the mad London property bubble! Sadly, their commute hasn't got easier! Ask an Expert What Happens When You Hire a Carpenter, Joiner or Cabinet-maker?